Just in time for #LawJobChat #3 (this Thursday, August 26th from 9-10 pm EDT! ), Amanda Ellis’s book is now available for pre-sale on Amazon. 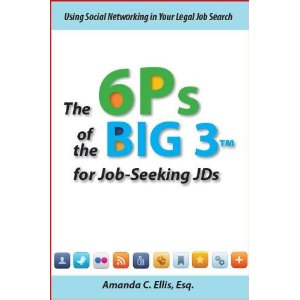 The book, 6Ps of the Big 3 for Job-Seeking JDs: 60+ Ways to Get Hired Using Social Networking, costs $27.95 and is eligible for free shipping. 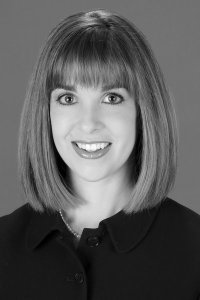 I’ll be the first to admit that I’m more than a little biased when I say that Amanda Ellis is an expert on social networking and the legal job search. After all, she and I have collaborated on a number of projects and we co-moderate #LawJobChat, a legal job search-themed chat on Twitter. FN1. At best, my endorsement may seem like expected support of a friend. At worst, it may seem like back-handed promotion of my own work. Amanda and I both practiced law for a bit before becoming legal recruiters. In late 2008, before we had met, we both recognized the potential of social networking sites in legal job searches, the changing nature of the legal industry, and decided to start our own firms with these new philosophies in mind. We also both became active on LinkedIn, Twitter, and Facebook. In other words, it is not a coincidence that Amanda and I met on Twitter in early 2009. Whereas traditional legal recruiting is even more cut throat than law school – hard to believe, I know – when Amanda and I met on Twitter, we immediately began collaborating on projects and bouncing ideas back and forth on how we could best help lawyers find jobs they love. It was a natural partnership made in the clouds. In addition to her lateral recruiting, over the past few months, Amanda has dedicated her time and energy to her book and a supplemental talk that she presents at law schools around the country. I’m extremely proud of her and can’t wait to read the tips she offers. If her free newsletter is any indication, I’m sure I’ll learn new tips and tricks even I may have missed. With that disclaimer, I highly recommend that all JDs, recent and future, check out Amanda Ellis’s book when they embark on their job search. I know I will. FN1. ^ #LawJobChat is a monthly live chat on Twitter (“tweetchat”). On the last Thursday of every month from 9 pm – 10 pm Eastern, we invite guests hosts to chat about legal career paths and moderate incoming questions on Twitter.